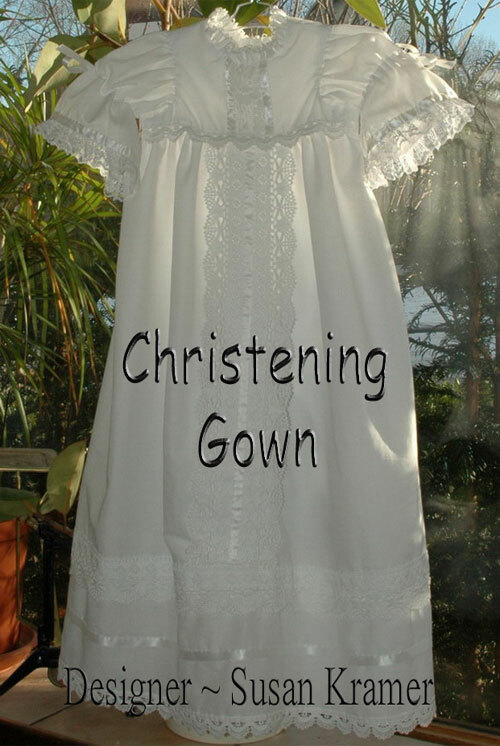 I thought it would be fun for all of us to follow me through the process of designing and making a Christening gown or dress. 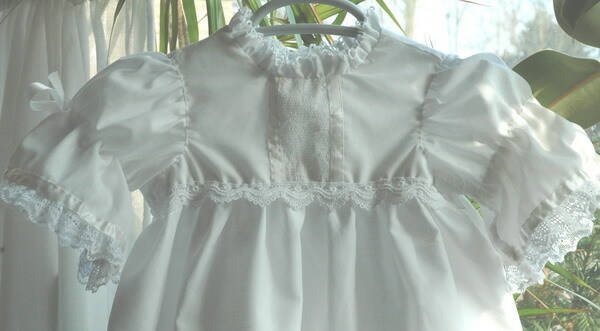 It is baby size 9 month to 1 year with a 22 inch (55cm) chest in the finished size. 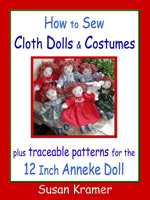 The entire gown will be sewn by hand with 1 strand of quilting thread, unless otherwise noted. 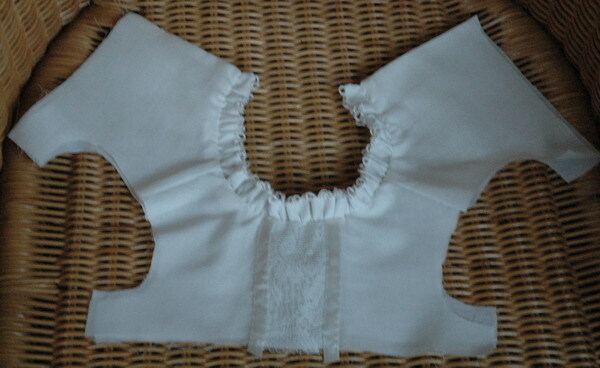 So far I've completed the bodice. The sleeves are cut out and ready to sew - perhaps tomorrow, then I'll update this page. 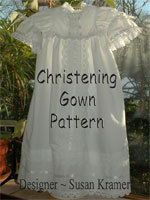 This particular Christening gown is going to be auctioned at the Fall 2010 event at the Little Sisters of the Poor home in Baltimore. This is a charity dear to my heart. One of my cousins is a nun in the order. The founder, Jeanne Jugan, was recently canonized by Pope Benedict XVI. 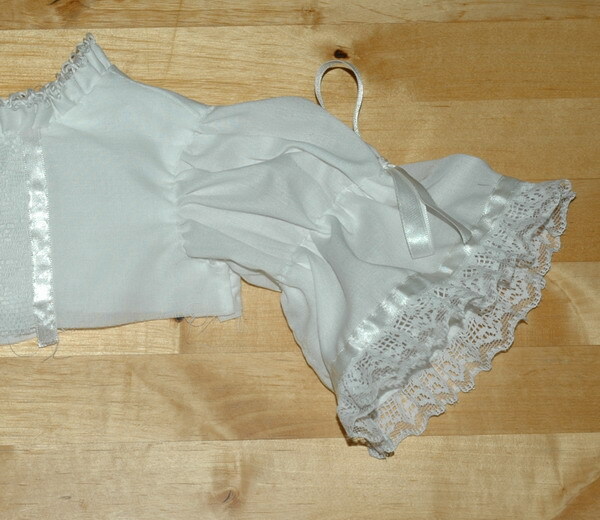 Here are some more views of the bodice. 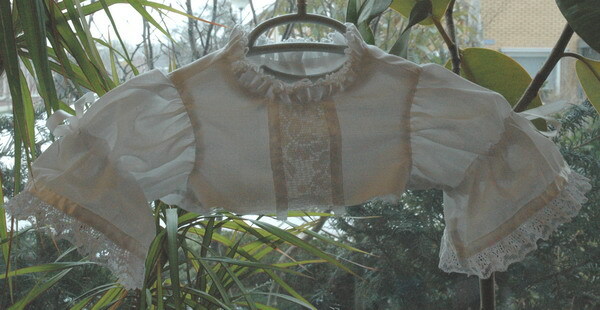 It is lined in the same fine sheer cotton as the finished bodice. 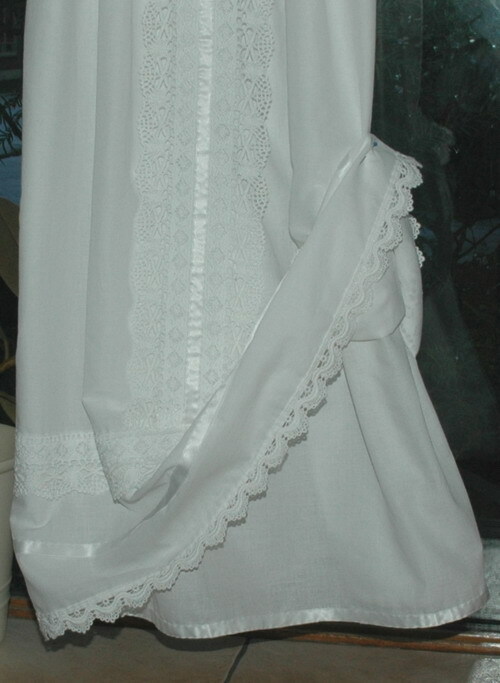 I crocheted a decorative stitch on the neckline ruffle with 6-strand embroidery thread. It took almost all day to sew and put in the first sleeve. The bow is a ribbon that is run through a channel formed by making a fold of the sleeve material to the inside and sewing it closed, then running the ribbon through on the inside and bringing it to the outside at the point you see it - even with the shoulder line. That way the ribbon is adjustable. I'm keeping it on the looser side; it's just for looks. I really pushed today and was able to sew the 2nd sleeve and set it into the bodice. 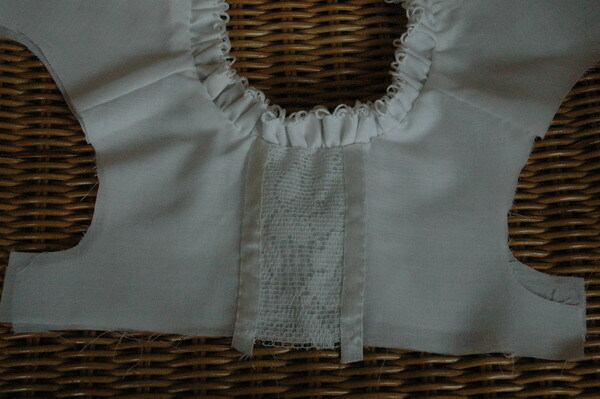 I also lined the bodice so there would not be anything scratchy against the baby's skin. In the photo below you can tell the bodice is lined, because it appears more opaque with the light shining through the fabric. The sleeves are not lined. Productive morning: I decided to make the lower edge of the skirt 46 inches (115cm) wide, and the lining the same. I gathered the top edge of skirt and lining twice and folded under a quarter inch of bodice and sewed it on top of the skirt and lining between the 2 rows of gathering. 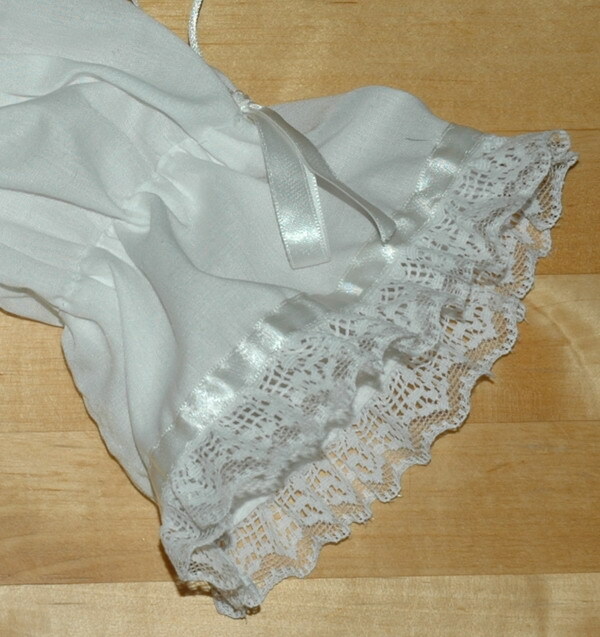 This allows you to adjust the gathers nicely so the skirt hangs well. 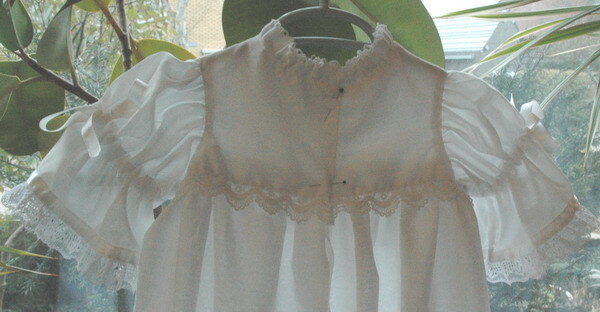 And then, I topstitched scalloped lace to the bodice topstitching. 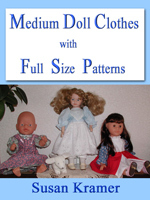 See photos below to illustrate this - front and back of dress.